An image of the installations at Latvijas Gaze‘s vast storage facility Incukalns in Murjani, Latvia. The Russian gas giant has decided to sell its share in Latvian assets in order to comply with the requirements of the European Union’s Third Energy Package. Gazprom has for the first time agreed to comply with the requirements of the European Union's Third Energy Package by agreeing to sell its share in Latvian natural gas company Latvijas Gaze. 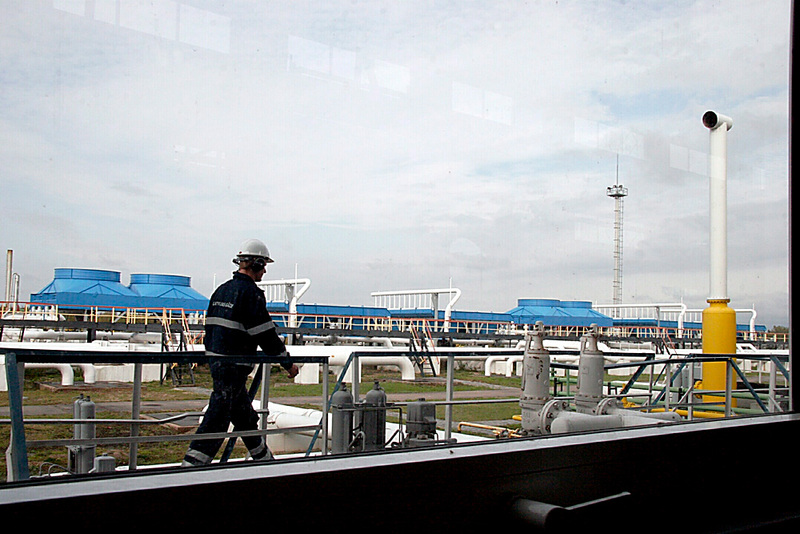 With a 34-percent stake, the Russian gas monopoly was the Latvian company's biggest shareholder. As a result of the selloff, Latvijas Gaze will be divided into two subsidiaries. One will sell and distribute gas and the other will store and transport it, the Kommersant business daily reports. The Third Energy Package bans energy companies from combining their generation and sale operations with ownership of transmission networks. It was because of these restrictions that the South Stream gas pipeline project, which envisaged the supply of Russian gas to Europe via a line under the Black Sea, was suspended in late 2014. The Russian company sees the EU requirements as politicized. According to Russian analysts, Gazprom has decided not to fight the requirements of the Third Energy Package in Latvia, having had a somewhat unfortunate experience in neighboring Lithuania. In 2012, the Lietuvos Dujos company, in which Gazprom held a 37-percent share, had to be split up by order of the European Commission. The Russian gas giant filed a lawsuit against Lithuania with the UN court of arbitration, UNCITRAL, to have the ruling to split up Lietuvos Dujos repealed, but in 2014 Gazprom gave up the fight, selling the Lithuanian assets for $164 million. "In 2012, Gazprom already got involved in legal battles and behind-the-scenes wars. It does not want to make the same mistake twice," said managing director of ThetaTrading research company Dmitry Ederman. According to him, another court battle would have been absolutely futile and very costly. Furthermore, Gazprom has been reassured that it will be able to sell its gas to Latvia and Lithuania at good prices irrespective of control over the infrastructure. On March 15-17, Gazprom's overseas trader, Gazprom Export, held its second ever and the Baltics' first gas auction. It sold 420 million cubic meters of gas to consumers in the region, more than 10 percent of its annual supplies. By way of comparison, in 2015, Gazprom Export supplied 4 billion cubic meters of gas to the Baltic states. "The price of the auction has not been disclosed but judging by the jovial comments from Gazprom representatives, it was quite attractive," explained Alexei Kalachev, an analyst for the Finam investment company. It became clear, he continued, that to conduct successful business the Russian gas monopoly does not have to control the infrastructure and it is not going to lose anything from selling its share in Latvijas Gaze. The reorganization of Gazprom's presence in Latvia means that the Russian gas giant is ready for new rules of the game. "The Third Energy Package is changing the rules of the game on the European gas market away from the monopolistic position of individual players in Europe as a whole and in each European country in particular," said Alexei Kalachev. Therefore Gazprom has a choice: either to resist and fight this or to adapt to the new rules and learn how to use them to one's advantage. In addition, according to Ilya Balakirev, an analyst with the Premier investment company, Gazprom's move may be intended to demonstrate "exemplary behavior" bearing in mind the future Nord Stream 2 project, which is yet to be approved by the European Commission. The project consists of a gas pipeline with a capacity of 55 billion cubic meters to carry gas through the Baltic Sea from Russia to Germany. This would cut out transit countries in Eastern Europe, in particular Ukraine, with which Gazprom has come into conflict on several occasions over disputed payments, resulting in supply to Europe being temporarily cut off. With the first phase of the pipeline coming on stream, Gazprom's annual supplies to Germany will double, to reach 110 billion cubic meters of gas. According to Georgy Vashchenko, head of the Russian stock market division at the Freedom Finance investment company, the pressure on the Russian monopoly may continue and “Gazprom may have to cede its European transmission and pipeline maintenance operations to [its] partners." In that case, he predicts, Gazprom will focus exclusively on gas sales.